The mission of our food pantry is to provide supplemental food to the needy in Walton and Okaloosa county who have been impacted by financial struggles as a result of unemployment, divorce, health issues, domestic violence, aging, and even homelessness. In giving back to the our community, we operate as a PAY IT FORWARD PROGRAM and with such clients are required to participate in community service hours helping to help the next person in need. Our center has a variety of opportunities for clients to participate in, even those who may have mental and or physical limitations. Waivers are available to clients with IMPOSSIBLE circumstances; however we pride ourselves in trying to find solutions that work for everyone. We gather, store and distribute goods to those who find themselves in a time of special need and crisis. Our mission is based on a compassionate hand up not a hand out, as we respect the dignity of all our clients. others who share our mission. 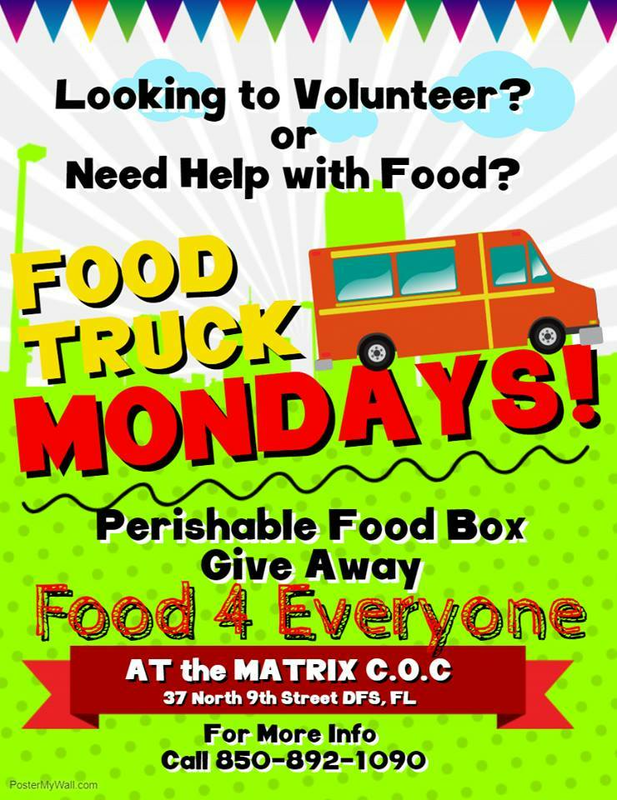 Daily Non Perishable Food Boxes: Requires Pay It Forward participation with waivers available.Clients are limited to the number of food boxes in a given time frame and are required to apply for food assistance with our DCF case worker, who is on site weekly. Case management is also provided to help clients utilize other types of assistance available through a number of programs we offer. Monday Perishable Food Boxes: Pre-Bag/Boxed perishable foods are given out every Monday on a first come first serve basis when available. Same day registration is required, first and last name, address, phone number and # of members living in household. Clients are encouraged to meet with an on site case worker to apply for foods stamps and utilizes other types of assistance to help them during their time of need. "Feed the Community" Food Distributions: 3-4 times a year, no documentation, or pay it forward participation is required. These are special distributions scheduled throughout the year when surplus foods are available. Check back for scheduling updates.